This review and giveaway about detecting odors in your home was made possible by Double Duty Divas and Febreze. I was compensated for my participation in this campaign, but all opinions are 100% mine. Most likely you are desensitized to the odors in your own home. Unless your child has forgotten to take out the garbage or your dog had an accident in the house, you rarely notice any smells that may not be appealing to guests. We are all guilty of walking into another persons house and recognizing a musty or heavy spice scent then talking about it to our spouse on the way home. Well, now it is time to take the Noseblind test with Febreze and see just what people are smelling in your house since we might be noseblind to our own odors we smell everyday. We watch movies in our basement, aka our Man Cave, which really has evolved to a media center and mud room for the kids. We have all of our cubbies for sports and school equipment on one half of the room and the other half is carpeted with a TV and bar area. I have always thought it smelled a little muggy down there since it was a basement but taking the Frebreze Noseblind test was a little nerve-wracking. My guests and myself were asked to fill out several surveys on the odors we smelled in the house. Then I popped some popcorn, took another survey about the odors. Waited until the movie ended, took another survey and then used a Febreze product and took yet another survey. Don’t worry this were 4 or 5 question surveys. I was amazed by the difference Febreze made on detecting the odors in the basement. I plugged in one of the Febreze NOTICEables Warmer in the bathroom downstairs. Even on the low setting you can smell it from the top of the stairs. I am used to the sometimes wet dog smell from Chloe but why should visitors have to smell it too. See what others are saying about the Febreze Noseblind test on Twitter and Facebook. Enter to Rafflecopter Below and GOOD LUCK! Giveaway ends 7/29. I am most excited about the Febreze candle! I love Febreze products and candles so the fact that they are mixed makes it that much better! I’m most excited about the candle because I always love the way they smell but forget to buy them! Thanks for the giveaway… we like the Febreze Noticeables plug-ins; they are not too over-powering, just enough scent. I am most excited by the Febreze Fabric Refresher to freshen up my kids sports uniforms. I am most excited about the Febreze Noticeables. I am most excited about the candle. I love candles and Ilove what febreze does for mmy upholstery. I am most excited about the Febreze candle. I love them! Since I have quite a few allergies, I’m most excited to try the Febreze Air Effects Freshly Clean Air Freshener Allergen Reducer Spray! I’m really excited about the febreze plugin. They work so well in the bathroom. I’m excited about the Febreze Air Effects. I’m most excited about the Febreze AIr Effects—I’m hoping it will help me eliminate litter box odors from my home! I am most excited about the Febreze Air Effects! I am excited about Febreze Air Effects. I can’t get enough of Febreze Fabric Refresher. I have a dirty kid and pets so it comes in handy quite a bit. Im excited about the candle, i have to admit im a bit candle obsessed! I haven’t ever used a febreze candle, so I’d be interested in trying one to see how they compare with my other favorite brands! I am most excited about the Febreeze Candles. Especially the Meadow and Rain scent. I am most excited to try the Febreze Fabric Refresher. It sounds so perfect to make my living room smell clean and fresh. I am excited to try the Febreze Noticeables. I’m most excited about the candle! I’ve always been curious but never tried it. I am most excited about the Febreze Air Effects. I am excited about the Febreze Candle, I really like candles. I am most excited about the air effects and the American express gift card. I am most excited about the Febreeze fabric refresher. All the men in my house leave funky man smells on my couch. I am most excited about febreze air effects in the sky & linen scent. I am most excited about NOTICEables Plug-Ins and really want to try Grapefruit Fizz. I would like to try the febreze candle. I am most excited for the Febreze Candle. I am most excited about the Febreze Fabric Refresher. I am most excited about the Fabreeze Noticeables. I’m chuffed at the idea of the Febreze Fabric Refresher. Got some upholstery that could use refreshing, for sure. I’m most excited about the Febreze Noticeabables. I have not tried the Air Effects yet, so I’d be excited to try it. The fabric refresher because our furbabies use the fabric club chair in the great room as a lounge. I am most excited about the Febreze plug in freshener. I’m most excited about the Febreze Noticeables – I use them all the time. I’m most excited about the candle. What a fun little test! Febreze products are always fabulous and effective! I’m a big fan of candles — they are both decorative and aromatic — and so I’m excited by the Febreze Candle! I’m most excited to use the Febreze Fabric Refresher. 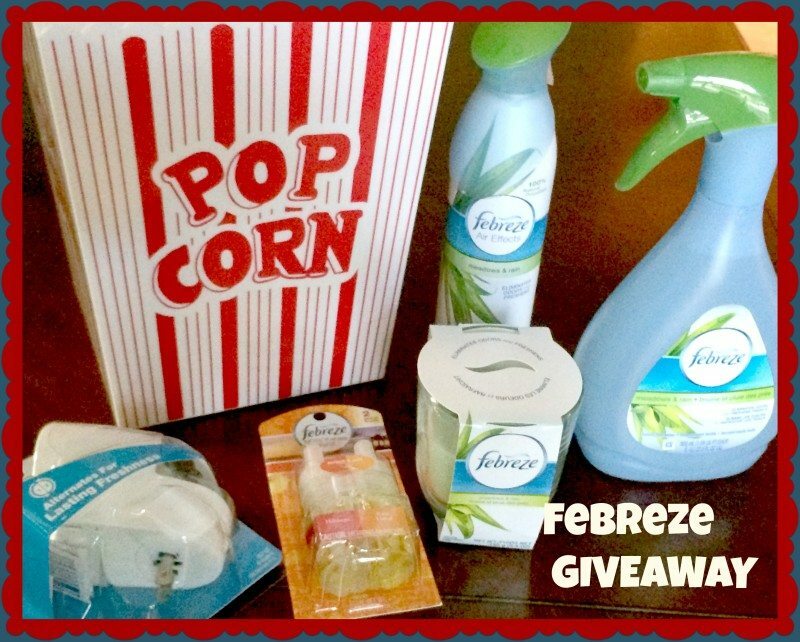 I want to smell (and win) the Febreze candles! I am really excited to try the Febreze Air Effects! With 3 large dogs, I am sure we are Noseblind with the dog odors! Id like to try out the air effects spray. I’m excited about the Air Effects – I use this often. I’m excited about the fabric refresher, they all sound like great products! I love their candles! It helps controls the scents in our home of our three furbabies! I am excited for the card and the Febreze Noticeables with refill. Thanks for the chance to win this nice prize! I am most excited about the candle and the plug in! I love Febreeze plug ins! I’m most excited about the Febreze candles. I would like to try a few of those. Thanks for the giveaway! I’d love to try the Febreze Candle. The AMEX card is pretty exciting too! I am most excited to try Febreze candle, thank you for the opportunity to win! I’m most excited about Air Effects in the Crisp Clean scent. I am most anxious to try the Fabreze Fabric refresher. I want to try the candles!! I’m excited about the Febreze Noticeables with refill. Thank you!! I am most excited about the Febreze Noticeables with refill. I really like the Febreze Fabric Refresher. I am most excite about the Febreze plug in freshener. The fabric refresher is what I’d like to try first. I’m most excited about the Fabric Refresher. Besides the AMEX, I am excited about the fabric refresher! I’m most excited to try the Febreze Noticeables with refill. I love Fabreze. I haven’t tried their candles yet so I’m excited to try those. The Fabric refresher spray I’m most excited about. Love Frebreze scents. This is a great giveaway and I have yet to try the scent test on friends. Thanks for sharing. I’m most excited about the Air Effects! I like the Original Scent. I am most excited about the $60 American Express Gift Card! The product I am most excited about is the Febreze Noticables! Although, I have to admit I am a Febreze “junkie”, and love anything and everything that contains Febreze in it (including the fabric softener sheets and carpet fresh). You could say that I’m excited about everything Febreze, and it’s hard to pick just one thing that you’ve listed, but I do love the Noticables and am ready to load the house with the Febreze win! I am excited to try Febreze Air Effects. Definitely the Air effects. I am always so worried about the smell of my house. Great product. I am excited for the Febreze Air Effects spray!!! Love using Febreze in my home. It’s the only brand that really gets odors out and stay out. Febreze really does bring in a good scent. It makes the house a lot more refreshing and odor free. I have always loved Febreze products- especially the pumpkin spice limited edition scent. I have been meaning to try one of their candles though! I’m most excited about the fabric refresher! I love having fresh smelling clothes. Such a great idea! I have always wondered if it really makes a difference from the commercials! I am excited about the febreeze noticeables! I am excited about the AMEX gift card. Honestly, the American Express card is what I would be most excited about, but I LOVE Febreze products. This is a great giveaway! I probably singlehandedly keep Febreeze in business with all I buy. Love all their products! I especially love the sleep effects, they are wonderful! I don’t think I could live without Febreze that stuff is simply amazing. I also hate the lingering smell that popcorn leaves….yuck! I am most excited about the Febreze Candle because I haven’t tried the Febreze Candles just yet. Great give away, Febreze is always my go to product to make the house smell better. I’m all about the Febreze Air Effects. I’ve heard they really work, and I love sprays because they quickly disperse into the air so they can do their thing. We have cans of these around the house incase we need it.. it really takes away the wet dog smell.. I am most excited for the Febreze room spray. I have a whole collection of them. It is truly an addiction for me. I love using the Febreze Air Effects. It is the only thing that really takes away all of the odors. I love Febreze candles so I would be most excited to win that. i really need to try the Febreze candle!! Thats wonderful you could smell it from the top of the stairs! Certainly helps to kill odors. I love the Air Effects – it smells so good and really doesn’t overpower my room. Some of the other brands that are available stink worse than the smell itself! I love the Febreze ones! I’m most excited to try the Febreze candle. I’m excited to try the Febreze Air Effects. I’m most excited to try the Febreze Air Effects. I am most excited about the Febreze Noticeables with refill. YAY! I am excited about the Febreze Air Effects! I like these sprays because they really work!